Descripción: Libro por Andreas Goransson y David Cuartielles, Wiley/Wrox 408 páginas. ARDUINO para ANDROID. EN INGLES. PROFESSIONAL ANDROID OPEN ACCESSORY PROGRAMMING. Learn how to control your home or car from your Android smartphone - air conditioning, lights, entertainment systems, and more! Android Open Accessory is a new, simple, and secure protocol for connecting any microcontroller-empowered device to an Android smartphone or tablet. This Wrox guide shows Android programmers how to use AOA with Arduino, the microcontroller platform, to control such systems as lighting, air conditioning, and entertainment systems from Android devices. Furthermore, it teaches the circuit-building skills needed to create games and practical products that also take advantage of Android technology. 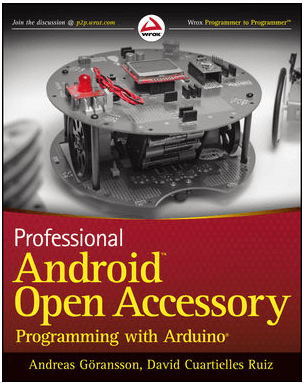 Professional Android Open Accessory with Android ADK and Arduino opens exciting new opportunities for Android developers.